"Rating: 10/10" - As featured in "iPhone & iPad Essential Apps" magazine. ••• Special Free Edition ••• Perfect for those traveling to Italy, including Rome, Venice and Milan, or the Vatican City and other Italian speaking regions, this phrasebook is designed to do exactly what the name says - make speaking Italian easy for you. Written specifically for English-speakers, this highly accurate phrasebook leaves no room for mispronunciation. 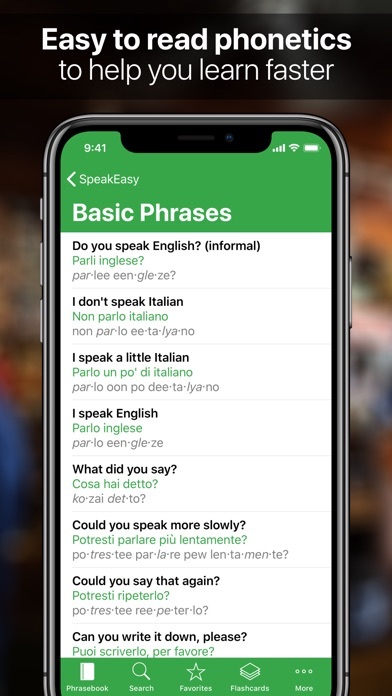 Each phrase includes a translation to Italian, an easy-to-read phonetic translation, and an audio recording of a native Italian speaker - all contained in a well structured, user-friendly interface. 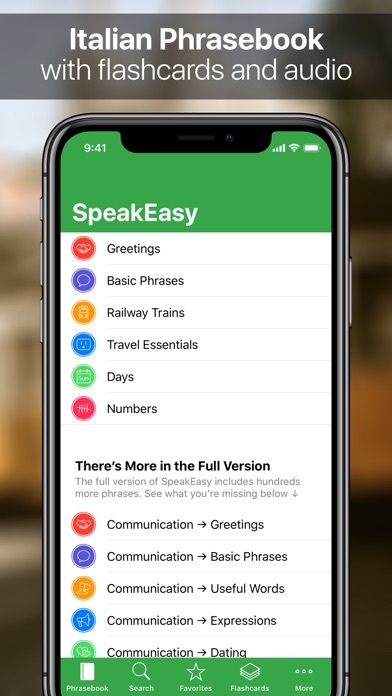 Whether you choose to browse phrases by category, or use the search facility to instantly find what you're looking for, SpeakEasy Italian is an efficient lifeline when you know what to say but don't know how. 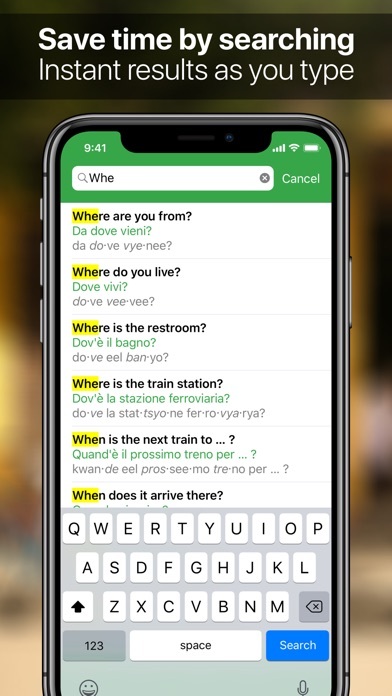 FEATURES • 160 essential travel phrases with both Italian and phonetic translations plus audio. Over 1,000 phrases are available in the Full Version. • Audio clips recorded by a native speaker to help you perfect your pronunciation. 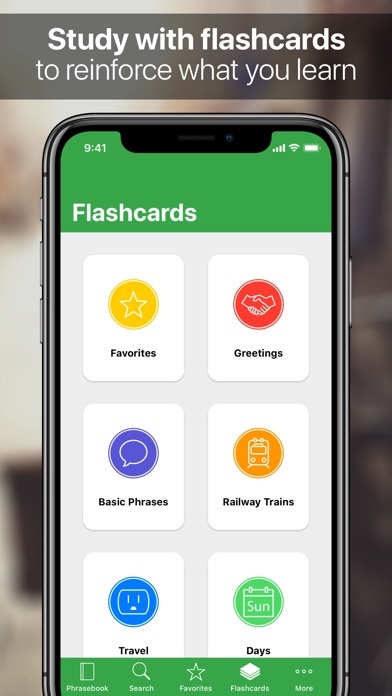 • Flashcards with English on one side and Italian on the other side, that you can use to study and test yourself. • Slow-play feature that plays audio at a slow speed to assist learning. • Search facility to instantly find the phrase you're looking for. • Favorites feature to provide fast access to your favorite phrases. • Adjustable text size. You can use a larger text size for added clarity. • Hide the phonetics. If you're a pro and don't need the extra assistance, the phonetics can be hidden. • Copy the translations to the clipboard and paste them into any app you wish. • Support for US English, UK English and Canadian English spelling. • No internet connection required. The app will work no matter where you are. INCLUDES OVER 160 PHRASES, SUCH AS: • Where is the restroom (toilet)? • What is your name? • How are you? • My name is … • Do you speak English? • I don't speak Italian • I speak a little Italian • I speak English • Could you speak more slowly? • How do you say ___ in Italian? • I need a translator • When is the next train to … ? I love this app. Great for pronunciation! For a complete novice this is a great app! Pronunciation is great, with option to hear in real time and slowly is very helpful. Also really appreciate the flash cards. App is nicely designed and easy to navigate with unnecessary bells and whistles. So far so good! Google translate is more useful. Found it. Tried it. Bought it. Have up on it. Such a limited number of phrases. Was expecting a more complete dictionary. How about a speed control feature? The darn app speaks too fast. This really helped me out for my trip to Italy! I am almost fluent and still learning!! Easy and simple. a must have!! App not much good as there are very few phrases. Needs ten times more content. Dump it there are much better ones out there.